Going into the new century, Cambodia has plenty of good things going for itself. 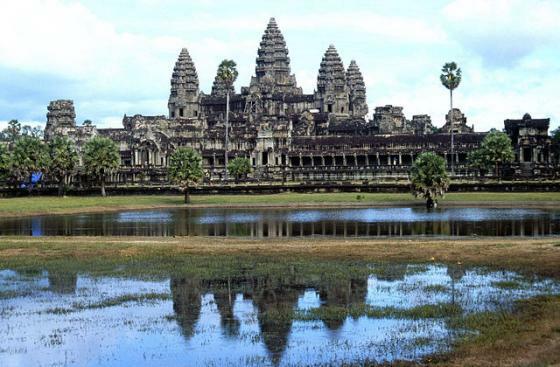 Looked down in the past as a backwater hellhole with bad hospitals and Potemkin villages, Cambodia has risen from the ashes and is now a gem of a place to do plenty of things. An emerging market in the most stable regional economic zone in the world, Cambodia has everything entrepreneurs want to explore and be the among the first to reap the rewards of having a business or social development project there. 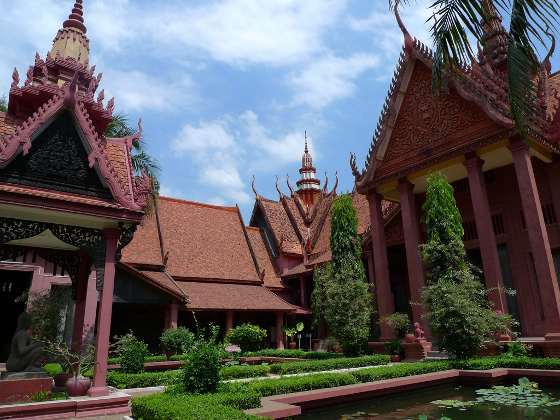 If you are from the ASEAN Integrated community, and are looking for a place that will grow and gracefully evolve into an economic and cultural tiger, Cambodia may just be your best bet. There will be growing pains for anyone who sets up shop in Phnom Penh because the Khmer government is still laying down the groundwork for everyone to play fair and get the best deal out of everything. The most gratifying news may be that local rules allow businesses to be fully owned by foreign investors and the relatively ease of moving money in and out of the country. In Cambodia, everyone loves to read. Families and young adults visit the local 'bookstore,' a nearby book-selling kiosk in the town's flea market, for the latest in cheap Khmer translated books. Enterprising urchins even buy some cheap books from the market and stack them in baskets and hawk the copies to foreigners lounging around the riverbank watering holes. Cambodia used to be one of the most sophisticated publishing industries before the Khmer Rouge annihilated most of the literate from academics to engineers and doctors. The literacy rate among the locals is estimated to be 37 per cent as of 2011. There is a growing cottage industry of do-it-yourself 'publishers' that are fueling an increasing demand for a wide variety of books: from romance novels to English to Khmer translations of popular western books--a shady practice that keeps hole-in-the-wall publishers alive. This might bode well for publishing houses looking for a niche market to grow into and in the future stake your claim as THE book provider for everyone Khmer. The latest studies show that it only takes $23 to make one Cambodian literate. Local libraries have outdated books and need good Khmer and English books. While old Khmer literary treasures are reportedly getting lost because archival technology and curation is insufficient to maintain these books in good condition, the government and plenty of organizations are doing their best to safekeep Khmer literary heritage books. Bookstores in Cambodia are improving slowly. Monument Books is the latest and the biggest shop in Phnom Penh and at the airport. D's Bookstores, a long favorite haunt among local book hunters, it hash five thrift book shops (one by the lake in the backpacker area and three in Phnom Penh and at least one in Siem Reap). Bohr's Books is another bookstore on the street just behind the FCCC (Foreign Correspondents Club of Cambodia). Talented English writers/educators or translators may find good opportunities in publishing while making good effort to learn the local Khmer language. If we are familiar with how the Americans set up schools and universities in the Philippines at the turn of the century in the 1900s, helping put up a school in Cambodia may provide unexpected rewards as it grows and becomes a legit source for the Khmer locals to improve their learning and economic standing. The local Khmer populace directly lacks sufficient technically proficient workers to keep up with demand from investors. Whoever is available may already be working for a foreign company based in the capital or will be working overseas for dollars like most Southeast Asian stories about hard-working locals pursuing greener pasture in foreign lands. Unlike most of the ASEAN integrated community where grid systems are already in place and political hegemonies have already barricaded market territories amongst themselves, Cambodia is still a wide open frontier for both regional and western investors. The government has already partnered with Vietnamese and Chinese companies to develop areas with plenty of natural resources for the funds it will pump into the system--this is goes for the development and mining industries. Other business opportunities like tech start-ups might prefer Singapore or Thailand and even China, but Cambodia offers start-up entrepreneurs the unique position of being in there before everyone else figured out they should too. Any opportunity to develop the Khmer locals to be technically skilled for your project will always be looked upon favorably by all parties involved. There might be more western and regional businesses looking into Cambodia for a chance to expand into Asia from there or outsource their work teams from the ASEAN integrated community and direly need skilled workers. Being there and being the most proficiently skilled available person for any job opportunity might work for some who are crowded out by the local job market But you must be willing to work in Phnom Penh's CBD or anywhere in Cambodia. The ASEAN integrated community offers this chance to all regional members. The capital Phnom Penh is where those who want to use Cambodia as a base for corporate work or as a start-up home base for a tech service, as well as other tech skill jobs and the like. The cost of living may be relatively cheaper than Thailand but it will still cost investors more to do business in the capital than anywhere else in Cambodia. From setting up shop to settling down in a new ASEAN home. Often derided by snarky westerners taking an evil eye at a certain kind of Asian tourism by expat western men and supposedly a difficult place to live in because of poor health care options and shady safety and law enforcement situation, the capital is actually be the safest place for an urban resettler and it does have good hospitals. Accomodations in Phnom Penh can vary from about 6000 baht a month to more than twice that. 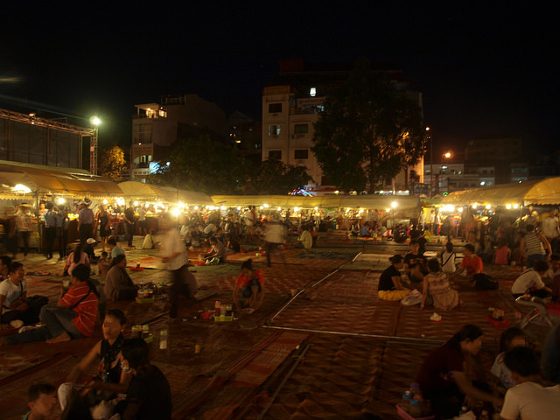 Phnom Penh has a riverside market and cultural heritage, nightlife (restaurants, clubs with music entertainment) and malls similar to the best of Asia. Japanese retailer Aeon opened Cambodia's first giant shopping mall a while back and as of late last year, plans to open a second supermall. 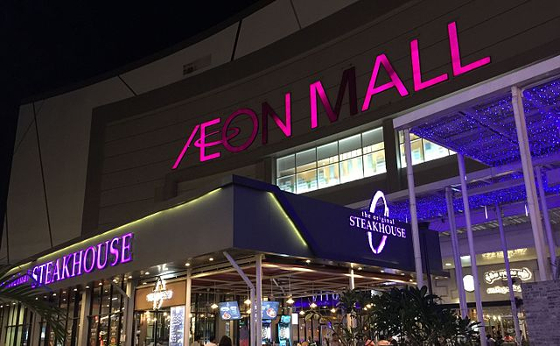 The Aeon Mall officially opened on June 30. The 68,000-sq meter supermall is in the center of the Cambodian capital. Aeon supermalls are literally supergiant supermarkets with retail shops clustered around it, in this case, around 190 brand retailers and food outlets. The current Aeon Mall shopping city took 20 billion yen ($195 million) to build and is looking at a bright future. The second planned mall city will be in the CBD, called Pong Peay City, a new gentrified area of the capital. If Japan retailers are making a big push into Cambodia to carve market territories before others do, they might know of plenty of good things coming together in the capital and throughout the Khmer nation. Siam Reap is the main tourist trap and cultural magnet. The place has posh western restaurants and upscale accommodations because of the ancient temple ruins of Angkor Wat, which attracts backpackers and culture vultures wanting a glimpse into the exotic history of the Khmer people. Self-appointed artistes and curious western students love to explore this part of Cambodia for some kind of connection with the locals, learning who they are and feeling out if they want to stay with new Khmer friends. Cambodians are a fierce yet friendly people with a hope for the future. Siem Reap is one place where both leisure travel and business travel come together and create opportunities where people break barriers and work to keep hope, a reward in itself. Kick back and knock yourself out, only in Cambodia. Sihanoukville is a coastal community that is another open secret among western backpackers looking for gorgeous Asian beachside communities to disappear in and spend lots of downtime--making a tech start-up work or putting regional business plans together. It is the utopian, off-grid, middle-of-nowhere place in Asia where one can put in part-time work so one can have more time at the beach--which has always been Asia's potent come-on for westerners, male or female. looking serene in low season. Backpacker paradise. 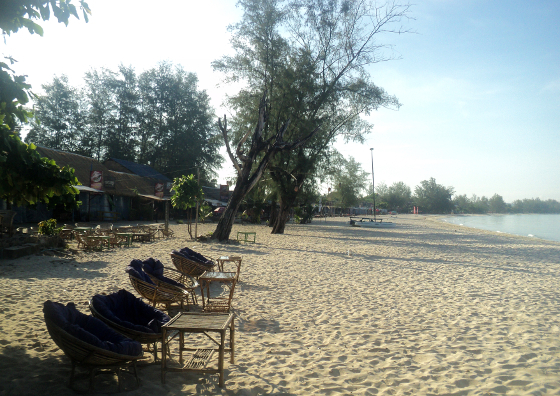 Ocheteaul and Serendipity are the most popular beaches in Sihanoukville. Both are still underdeveloped and not as bad a tourist trap as expensive Thai resorts or southern beach holiday spots in the Philippines, but this coastal paradise still has decent bars and nightlife to keep partying visitors happy. There are some shops near the area for your weekly grocery-food resupply run, and other shopping needs if you are indeed situated there as a bootstrapped-backpacker, web worker--cooking up a venture deal for your Next-Big-Thing project while doing all your creative brainstorming at the beach. Don't forget to send a postcard selfie with the dudebro sign back home. Peace.